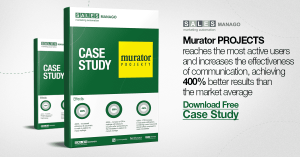 Murator Projects with the help of SALESmanago Marketing Automation reaches the most active users thanks to segmentation with scoring, increases the effectiveness of communication thanks to automatic mailings, achieving 400% better results than the market average. Murator PROJECTS is a leading Polish supplier of ready-made projects and consulting services for the construction and architectural industries. Every year, it introduces over 100 new projects that respond to current needs and expectations of investors. In addition to ready-made projects, it also realizes individual orders and offers free consulting for specialists: architects, appraisers and credit experts. For over 20 years of activity, almost 200,000 people, both in Poland and abroad, decided to live in a house from the Murator Collection.